Looking for Fax Machines ? Fax Machine We are the Dealer and supplier of Fax Machines We deal mainly in Hyderaba...We are the Dealer and supplier of Fax Machines We deal mainly in Hyderabad ,Telangana and Andhra Pradesh. Franking Machines We are offering our client an excellent quality range of Franking Machines. These Franking Machines have brought a revolution in cost effective convenience for up-and-coming businesses, at home or in ...We are offering our client an excellent quality range of Franking Machines. These Franking Machines have brought a revolution in cost effective convenience for up-and-coming businesses, at home or in the offices. Our range of Franking Machines are available at most reasonable prices. Fax Machines Our Fax machines are ideally suited for every type of business needs from low volume use in a small business environment to high volume use in large organizations. Our ra...Our Fax machines are ideally suited for every type of business needs from low volume use in a small business environment to high volume use in large organizations. 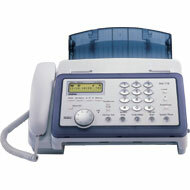 Our range includes Fax Machines, Industrial Fax Machine and Office Fax Machine. Epabx Machine We are offering high quality EPABX Machine to our most reliable customers which are situated all round the nation. These EPABX Machine ...We are offering high quality EPABX Machine to our most reliable customers which are situated all round the nation. These EPABX Machine are available in various specifications and dimensions. Fax Machines Fax -Thermal-Plain Paper-Laser & Multifunction machines from world leaders like Panas...Fax -Thermal-Plain Paper-Laser & Multifunction machines from world leaders like Panasonic, HP, Samsung, Canon, Brother etc. The word Fax originates from the latin words fac simile meaning "making a copy". Fax is a telecommunication technology used to transfer copies (facsimiles) of documents, especially using affordable devices operating over the telephone network. The word telefax, short for telefacsimile, for "make a copy at a distance", is also used as a synonym. The device is also known as a telecopier in various places. To fax or faxing is by definition "a method of encoding data, transmitting it over a telephone line or radio broadcast and receiving a hard copy of the text, line drawings, or photographs at a remote location". The technology for Fax Machines was invented a long time, however, Fax Machines did not become popular with consumers until the 1980s. The first Fax Machine was invented by Scottish mechanic and inventor Alexander Bain. In 1843, Alexander Bain received a British patent for improvements in producing and regulating electric currents and improvement in timepieces and in electric printing and signal telegraphs, in laymen's terms a Fax Machine. In 1862, the Italian physicist Giovanni Caselli built a machine he called a pantelegraph (implying a hybrid of pantograph and telegraph), which was based on Bain’s invention, but also included a synchronizing apparatus. His pantelegraph was used by the French Post & Telegraph agency between Paris and Marseilles from 1856 to 1870. For many years, facsimile machines remained cumbersome, expensive and difficult to operate, but in 1966 Xerox introduced the Magnafax Telecopier, a smaller, 46-pound facsimile machine that was easier to use and could be connected to any telephone line. Using this machine, a letter-sized document took about six minutes to transmit. The process was slow, but it represented a major technological step. In the late 1970s, Japanese companies entered the market and soon a new generation of faster, smaller and more efficient fax machines became available. Alexander Bain's Fax Machine transmitter scanned a flat metal surface using a stylus mounted on a pendulum. The stylus picked up images from the metal surface. An amateur clock maker, Alexander Bain combined parts from clock mechanisms together with telegraph machines to invent his Fax Machine. Most of the early designs involved a rotating drum. To send a fax, one would attach the piece of paper to the drum, with the print facing outward. There was a small photo sensor with a lens and a light. The photo sensor was attached to an arm and faced the sheet of paper and the arm could move downward over the sheet of paper from one end to the other as the sheet rotated on the drum. In other words, it worked something like a lathe. The photo sensor was able to focus in and look at a very small spot on the piece of paper -- perhaps an area of 0.01 inches squared (0.25 millimeters squared). That little patch of paper would be either black or white. The drum would rotate so that the photo sensor could examine one line of the sheet of paper and then move down a line. It did this either step-wise or in a very long spiral. To transmit the information through a phone line, early Fax Machines used a very simple technique: If the spot of paper that the photo cell was looking at were white, the Fax Machine would send one tone; if it were black, it would send a different tone. For example, it might have sent an 800-Hertz tone for white and a 1,300-Hertz tone for black. At the receiving end, there would be a similar rotating-drum mechanism, and some sort of pen to mark on the paper. When the receiving Fax Machine heard a 1,300-Hertz tone it would apply the pen to the paper, and when it heard an 800-Hertz tone it would take the pen off the paper. A modern Fax Machine does not have the rotating drums and is a lot faster, but it uses the same basic mechanics to get the job done. A modern Fax Machine uses telephone lines to transmit copies of documents. At the sending end, there is some sort of sensor to read the document. It has a scanner with a horizontal resolution of 203 pixels per inch. It is the source projecting a light beam and a photo electric cell. Usually, a Fax Machine has a paper-feed mechanism for sending multi-page faxes. If one looks carefully at a line in a page, one would observe the line would either cut across the black text or blank spots. The scanner then determines whether that spot of paper is white or black. The information is then encoded and is represented as a bit. And each line is represented by 1,728 bits. It encodes white and black spots that the Fax Machine sees on the paper and transfers it to the receiving end. The encoded data is compressed before sending. At the receiving end it is decoded, uncompressed and reassembled into the scanned lines of the original document and then printed. In short, Fax Machines work by digitizing an image i.e. dividing it into a grid of dots. Each dot is either on or off, depending on whether it is black or white. Electronically, each dot is represented by a bit that has a value of either 0 (off) or 1 (on). In this way, the Fax Machine translates a picture into a series of zeros and ones (called a bit map) that can be transmitted like normal computer data. On the receiving side, a Fax Machine reads the incoming data, translates the zeros and ones back into dots, and reprints the picture. Printing Technology: Nearly all fax machines use plain office paper. Less expensive models generally use thermal printing technology, and printouts don't have the same longevity as inkjet faxes. Inkjet faxes can usually print, copy and fax in colour. Laser fax machines are also available, though most are monochrome units. Laser fax machines usually print sharper text. Speed: Transmission speed ranges from about 15 seconds per page up to about 3 seconds per page. If you only need to send the occasional fax, you can save money by going with a slower model. Memory: Fax machines store incoming and outgoing pages in memory. This lets the machine save an incoming fax in memory if it runs out of paper, and then print the fax when the paper tray is reloaded. You should shoot for at least 512KB of memory, although some newer models have 8 to 16MB (up to 480 pages). Other features: Besides speaker phones and digital answering machines, some fax machines include such features as caller ID, a distinctive ring that enables it to distinguish between a human or fax machine call, auto redial, fax forwarding, polling, and speed dialing. You'll have to decide if you need those features. Fax Machines are usually differentiated by the features they have. By Speed: Fax Machines transmit data at different rates, from 4,800 bps to 28,800 bps. A 9,600-bps Fax Machine typically requires 10 to 20 seconds to transmit one page. Printer type: Most Fax Machines use a thermal printer that requires special paper that tends to turn yellow or brown after a period. More expensive Fax Machines have printers that can print on regular bond paper. Paper size: The thermal paper used in most Fax Machines comes in two basic sizes: 8.5-inches wide and 10.1-inches wide. Some machines accept only the narrow-sized paper. Paper cutter: Most Fax Machines include a paper cutter because the thermal paper that most Fax Machines use comes in rolls. The least expensive models and portable faxes, however, may not include a paper cutter. Paper feed: Most Fax Machines have paper feeds so that you can send multiple-page documents without manually feeding each page into the machine. Auto-dialing: Fax Machines come with a variety of dialing features. Some enable you to program the fax to send a document at a future time so that you can take advantage of the lowest telephone rates. Many inventors after Alexander Bain, worked hard on inventing and improving Fax Machine type devices. » In 1843 the first Fax Machine was invented by Scottish mechanic and inventor Alexander Bain. » In 1850, a London inventor named F. C. Blakewell received a patent what he called a "copying telegraph". » In 1860, a Fax Machine called the Pantelegraph sent the first fax between Paris and Lyon. The Pantelegraph was invented Giovanni Caselli. » In 1895, Ernest Hummel a watchmaker from St. Paul, Minnesota invented his competing device called the Telediagraph. » In 1902, Dr Arthur Korn invented an improved and practical fax, the photoelectric system. » In 1914, Edouard Belin established the concept of the remote fax for photo and news reporting. » In 1924, the telephotography machine (a type of Fax Machine) was used to send political convention photos long distance for newspaper publication. It was developed by the American Telephone & Telegraph Company (AT&T) worked to improve telephone fax technology. » By 1926, RCA invented the Radiophoto that faxed by using radio broadcasting technology. » In 1947, Alexander Muirhead invented a very successful Fax Machine. » On March 4, 1955, the first radio fax transmission was sent across the continent. 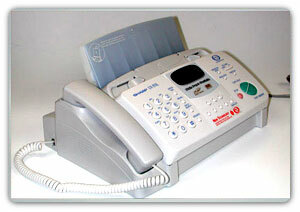 In recent years Fax Machines have been very successful and proven themselves extraordinarily. Today Fax Machines are in many cases replacing mail letters since facsimiles are received in a much shorter time. They are used by virtually all businesses and in many home as a means to transmit documents, images and drawings across the street or around the globe.